One thing about teachers – we love a good potluck! As you might have guessed, I’m typically designated with dessert, whether I like it or not. Now, you know I love cupcakes more than probably just about anyone, but sometimes I crave something a little lighter, fresher and fruitier. Last year, when our spring potluck happened to fall during the first week of May, we, of course, centered our potluck theme around Cinco de Mayo. Ever the procrastinator, by the time I got around to signing up, all the yummy Mexican-themed savory dishes like salsa, guacamole, chicken enchiladas and tortilla soup had been spoken for. Dessert, it seems, is my destiny, no matter what. I figured I’d whip up some Mexican Chocolate Cupcakes and call it done. But just before the potluck, I had a mild panic attack when I counted the short number of days between Cinco de Mayo and the date I’d first need to don something other than jeans and a t-shirt. Driven by panic, I decided to go on a very short-lived baking hiatus. When I say short lived – I mean it – I’m talking like maybe 4 days. 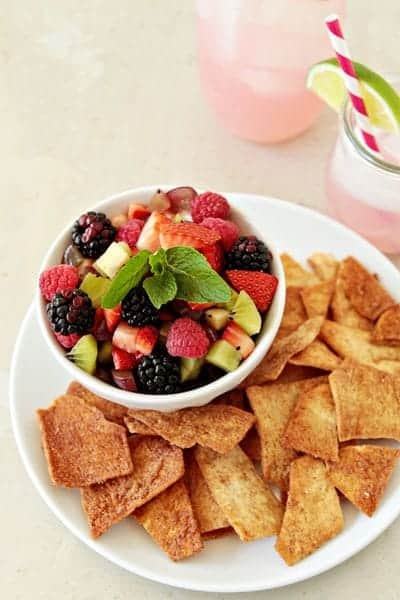 Driven by desperation (and thoughts of my waistline), instead of baking cupcakes I might be tempted to inhale, I put together a sweet fruit salsa that matches beyond perfectly with cinnamon and sugar pita chips. At our potluck, no one even questioned the lack of cupcake attendance. A sure sign of this fruit salsa equaling dessert success, I’d say! Fruit salsa comes together with ease, and with very few additional ingredients to the fresh fruit. The beauty of it is that you can really customize it to your tastes or what’s in season. Fruit salsa definitely shouldn’t be relegated to only Cinco de Mayo celebrations! Personally, I adore a mix of ripe berries, kiwi and grapes, but really, how could you go wrong with any kind of jam-glazed fruits scooped up with cinnamon and sugar pita chips? Once you’ve made fruit salsa once, you’ll be making it again and again. And those pita chips will become a permanent fixture on your grocery list. Trust me! In a large bowl, combine all of the ingredients and toss gently to coat with sugar and preserves. Cover and chill in the refrigerator for at least 15 minutes. Serve with Stacy's Cinnamon and Sugar Pita Chips. - Fruit Salsa in best served the day it is made. - If your fruit is really sweet, you may want to cut back on the sugar. Start with half the amount listed and gradually increase to your taste. Love the idea of fruit salsa! It looks amazing! This sounds absolutely delightful! Yum! Really like the sound of this but never heard of the cinammon sugar chips … is it a USA product or something to make? If you can’t find the pre-made chips at stores in the UK, you could make your own fairly easily. I use pita bread, cut it in triangles, spary with olive oil, sprinkle with cinnamon sugar and bake it for a few minutes. I’ve also used flour tortillas successfully. just take flour tortillias cut them with a pizza cutter in triangles bake them @350 for about 8-10 mins. on a stone..and then sprinkle with cinnamon & sugar..wa la you have s&c crisps. I dare say fruit is *almost* as satisfying as a cupcake. This is such a clever idea and such a great new way to use all of the wonderful berries we have during the spring and summer! What a great summer treat! Thank you. Making it this week! Yum! I love this salsa! I really love fruit and this will be so perfect for just eating by the spoonful! I’m going to the Farmers market today, so I am going to pick up some kiwi! so simple and fresh.. perfect for summer!! Seriously one of my favorite “desserts” ever, and I’m a huge baker. 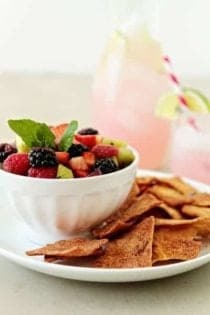 Those cinnamon sugar pita chips on their own are an addiction for me, but adding the fruit salsa makes it unbelievable. We’ve even make “nachos” by loading them up with fruit salsa and drizzled with hot fudge sauce. ahhhhmazing. Oh man, that sounds incredible! I wish I had some salsa left! Thanks so much for stopping by! Love the fruit salsa but I usually put on a tablespoon of maple syrup and it works really well with the fruit. Can’t wait for all the summer fruit to come in. YUM! I haven’t tried those pita chips. I will be on the lookout for them though! Ususally I make the flour tortillas, lightly buttered and dusted, generously, with cinn and sug mix. Cut into wedges and bake. Yum. There is a good Allrecipes listing for another fruit salsa recipe that is delish as well ! I love making and eating fruit salsa:) Great snack! Oh my, these look so adorable. I loved the freshness of these summer berries and the little garnish on top! WIth cinnamon sugar pitas they would be super awesome! YUM! 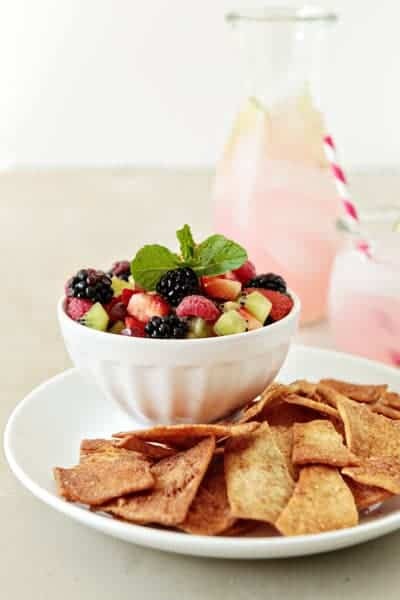 Those Stacy’s Cinnamon and Sugar Pita Chips are insanely good, great idea to pair them with the fruit salsa! I adore fruit salsa and yours is gorgeous! I found this via TidyMom and it looks wonderful. I’ve made one for years from Pampered Chef that is apples, strawberries & kiwi with apple butter and a little OJ concentrate. We always make cinnamon sugar tortilla chips, which you can spray the tortillas with water & then sprinkle on the cinn/sugar, they’re lighter that way & no added oil and turn out wonderful. Great salsa recipe! I should so make this for my next girls’ night and serve it with some cinnamon sugar tortilla chips… Yum! This looks absolutely divine…but where’s the recipe for those mexican chocolate cupcakes? I would love to be at any potluck where this is served as the dessert! Looks delicious, and so appropriate for spring! This has spring and summer written all over it! I love a good fruit salsa. Yum! A great way to get a little extra fruit in the ol’ diet! Gorgeous! Honestly, this is like a pregnant woman’s dream fruit cocktail dessert right here! I love this! This Fruit Salsa looks delicious!! All the colors in the bowl look amazing. I love the fruit pieces you’ve included in it, eapecially the raspberries. Thanks for another keeper! I had featured u in the post of Top 7 Super Yummy Fruit Recipes on AllFreshRecipes, i’ll pay close attention to ur recipes! I love cupcakes and chocolate .But I love cream cake best.I hope to see more recipes.